Welcome back, everyone! We certainly have finished this week on a high note with the return of the sunshine. Hopefully we have left the winter behind and focus on enjoying ourselves outside. This is a very unique time in the life of Kindergarten, for the children and ourselves. Suddenly, the children are very mature. They’ve returned to school quite serious, with keen listening skills, a sharp interest and more awareness in what they are doing. The children understand the importance of the school day routines, their self-regulation and how that affects their learning. We love how the children have internalised the expectations of the classroom, and their behaviour reflects that knowledge in how they clean up the classroom, set-up their printing page or line-up to leave the classroom, just to name a few. They are making connections between our daily activities and literature, to nature, and the broader scope of their environment and the world and verbalizing it. We’ve had a few “A HA!” moments already this week. It’s really quite amazing, and we are so privileged to be a part of your children’s learning. 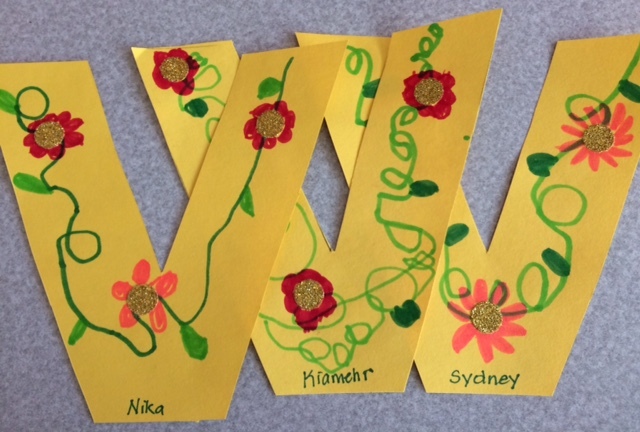 Without missing a beat, we’re right back at it with the letter “V is a vine” for our alphabet work. We’re continuing to work through our numeracy unit as we explore the number 8. We can see many children are used to playing games with dice as they recognise that 2 4s are 8 in a dice throw. 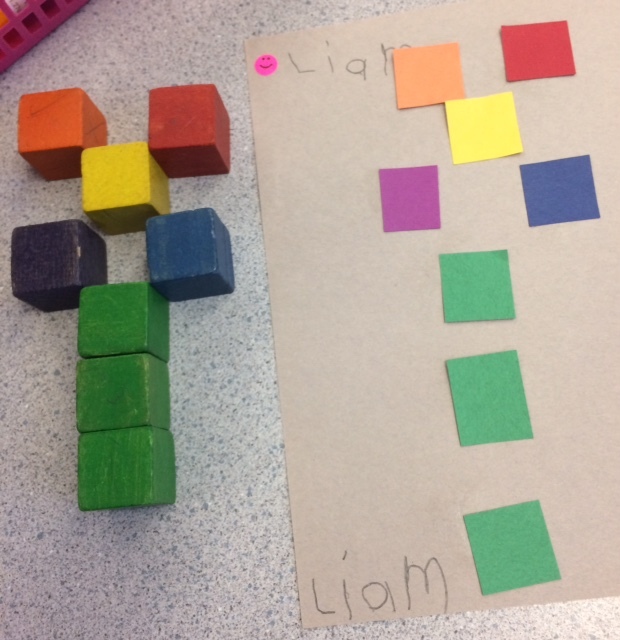 They also showed 8 using different kinds of materials such as blocks and bingo markers. 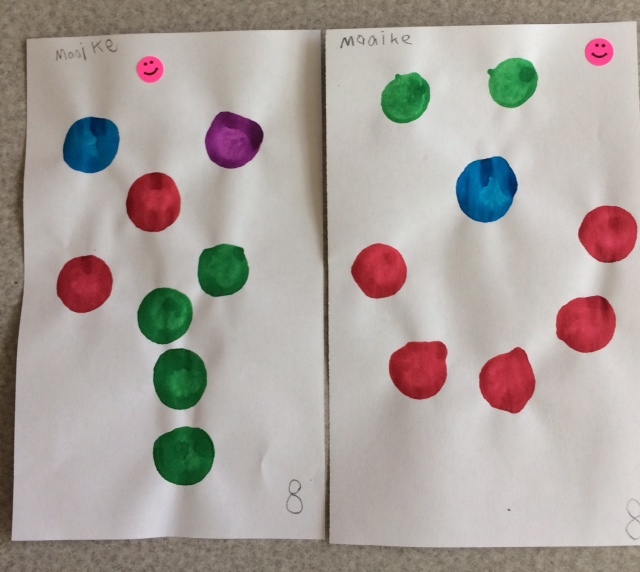 Sometimes, children got carried away and discovered they had bingo marked 9 or 10 dots for their picture; that led us to a good discussion about the importance of counting, keeping track of where we are and being mindful of the task. This week we started two weeks of Dance instruction during PE. We’re fortunate to have Mr. Aerhyn Lau here to teach us a great little hip hop dance to “Enjoy Yourself” by Michael Jackson. We’re pleased to see so many children trying to focus on the steps and sequences with energy and a positive attitude. Our sessions are long, and the children are on their feet the whole time; there’s lots of listening and repetition so they are to be congratulated for their perseverance in learning their dance. Please note that our students need to wear black pants and a yellow top for their dance performance on Friday, April 7. They will also need their running shoes. We’re still collecting the report card envelopes for our classes. The insert is yours to keep and we will recycle the envelopes for our third term report cards. We sent home a number of letters from Vancouver Coastal Health regarding Kindergarten student immunization. If you have already had your child immunized but forgot to notify the school, please make a copy of the immunization record and return it to your teacher so we can pass the information on to our school public health nurse. If you are not intending to immunize your child, please note that on your letter and return it to school. For everyone’s personal safety, Vancouver Coastal Health must be aware of who has not received immunizations so that in case of an outbreak, families can be notified. We will be celebrating the Persian New Year, Nowruz, on Tuesday, April 4. Thanks so much to our parent group for organising this special occasion for our Kindergarten children. We’re starting a new round of Sharing and Special Helper on Monday. Our theme will be “Signs of Spring.” We’ve read a few books and had several discussions on what would be appropriate to bring for sharing. We’ve talking about flowers from our gardens, pictures of our home garden, books about spring, things we might use in the spring (garden tools, baseball season begins, hockey playoffs) and a return of animals we see in the spring. So we have a few ideas and we ask parents to please support their child in finding something together to share at school. It’s fun for your child if you help them to write a little descriptive explanation for him or read to read (or for us to read) and explain. Wednesday, April 5th at 9 a.m. there will be an ELL Parent Cafe in the Ridgeview Library. Parents/guardians of Ridgeview second language students are invited to attend an informational workshop about Spring Assessments for ELL Learners. Please join Ridgeview ELL teachers to learn about the assessment process in West Vancouver. Ridgeview ELL teachers Mrs. Yioldassis, Ms. Wong, and Ms. Price will be available to answer your questions following this workshop.